St. Petersburg company returns to UK with classic works contrasting Russian characters with western counterparts. Conductor Valery Gergiev is again bringing the illustrious Mariinsky Theatre troupe to Britain, which is rapidly becoming the company’s second home. From November 3-5, the Barbican Centre in London will stage two operas in concert format based on literary masterpieces by Pushkin and Leskov: Mussorgsky’s Boris Godunov, and Rodion Shchedrin’s Levsha (The Left-Hander) – as well as the choral symphony Perezvony (Chimes) by Gavrilin. In August, the troupe completed a three-week ballet run in London and put on three opera performances at the Edinburgh Festival, while in November the opera troupe will present Wagner’s Der Ring des Nibelungen in Birmingham and Prokofiev’s Betrothal in a monastery in Cardiff. Despite all this abundant supply, demand for Boris and Perezvony has been high. “There are hardly any tickets left at the ticket offices,” the Barbican Centre’s representative Sabine Kindel told RBTH. Levsha is selling less well, and perhaps this is why the Barbican has organised pre-concert meetings with the opera’s author and his acclaimed spouse, the ballerina Maya Plisetskaya. Boris Godunov will open the three-night run and the remaining two evenings will show that Mussorgsky’s traditions are still alive a century and a half hence, both in opera (for example in Mariinsky “court composer” Shchedrin’s fresh opus) and in choir works, (Gavrilin, who died in 1999, was born six years after Shchedrin). Boris Godunov will be brought to London in its rarely performed first version, staged at the Mariinsky Theatre in 2012 by Graham Vick. 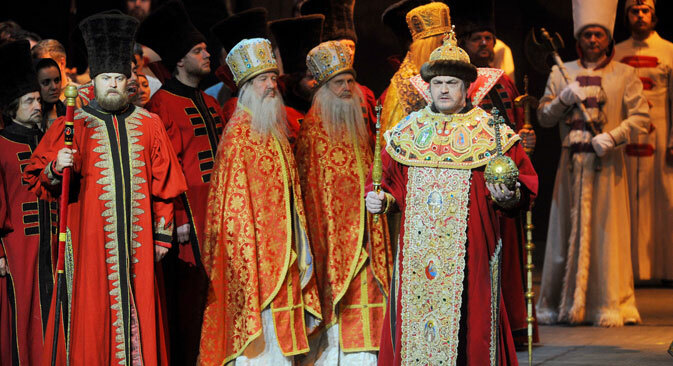 Slimmer and devoid of romantic intrigues, it pays more attention to the sumptuous Russian bass: the parts of Tsar Boris and the monk Pimen are performed by Mikhail Kazakov and Mikhail Petrenko. The continuity between Mussorgsky and Shchedrin is obvious. The latter borrowed the dramatic principle of “two camps” from the national theatre of the 19th century: Russians are presented in contrast to the western nations (in Boris Godunov the Poles; in Levsha the English), whereby the Russians predominantly sing and the foreigners mostly dance (in concert format, this will have to be imagined). Roughly speaking, the Russians act with the head, their foreign partners with their legs. Patriotism did not stop Mussorgsky or Shchedrin from showing sympathy towards foreigners: their parts are written rather charmingly. But the Russian listener will sense something cold and otherly in them all the same. What will the English viewer sense, seeing themselves reflected in the mirror of a Russian opera? Levsha is the quintessence of the Russian mentality, which emerges even more clearly in comparison with that of the English, who here are formal and cunning, valuing progress and money. Russians are talented and ill-adapted for life. Just as the English flea, artfully designed by Levsha, can no longer jump, Levsha is the same – attaining the peak of mastery, he dies of drunkenness, stifled by the bureaucracy surrounding him. Shchedrin says that he has long been partial to England. He even personally corrected Anthony Phillips’s translation of Levsha – corrected “meticulously even though the extent of his knowledge of the language is very imperfect”. Shchedrin expressed his fondness for England in Princess Charlotte, a character he introduced himself. This role is sung by mezzo-soprano and State Duma deputy Maria Maksakova. “The epoch of Princess Charlotte, who virtually ruled the kingdom in the time of George IV, corresponds to the time of Levsha. My heroine has many English characteristics: extreme tact, cordiality, and hospitality,” said Ms Maksakova. On the third day, the choir under the Mariinsky’s Andrei Petrenko will perform Russian spiritual compositions and Gavrilin’s Perezvony, a popular opus in Russia that also explores the secrets of the national mentality, in which hopeless melancholy is inseparable from self-irony. The visit by the Mariinsky is unlikely to be all plain sailing: the question of Gergiev’s ties to the Kremlin will inevitably be raised, ties which have already led to protests being staged against him. “The Barbican believes in the right to free speech, and, as with any Barbican event, people are able to protest and make their views known. However, we respectfully ask that these protests happen outside the venue and anyone disturbing the concerts would be asked to leave for the benefit of other audience members,” the Barbican management told RBTH. Ms Maksakova said: “Yes, I am a politician and musician all in one, but I am an exception. Music and politics are usually completely different things. And when Gergiev is at the podium, and not at a press conference, he is one of those great directors, the number of which in the world can be counted on one hand. At this moment it is just not right to get in the way of people who have come to hear music. It is no exaggeration to say that Gergiev is a face of the state. The Mariinsky’s most recent history is one of the finest examples of the splendid flourishing of a major institution in modern Russia. A year ago, Gergiev’s 60th birthday saw the unveiling of the Second Stage, a hi-tech complex with a stage the size of a football field. Gergiev had already built another hall with good acoustics in 2006, and the Mariinsky now puts on an unthinkable number of performances and concerts. Last season alone there were 1,036. From time to time this demanding schedule affects quality, especially if Gergiev is not in the theatre (an incredibly hardworking conductor, he is out on tour more than any other major conductor). Perhaps things will ease up after a couple years, when the old stage, built in 1860, will close for restoration? But knowing Gergiev, such hopes are likely to be in vain. He is sure to still be involved in touring – in London and elsewhere.